The launch of Khilta Bachpan campaign witnessed experts suggesting that arts education must be treated as part of mainstream education and not an extra-curricular activity. An age-old debate, there has been a growing emphasis on making “wholesome education” a part of school curriculum. This was even pointed out by Indian Prime Minister Narendra Modi in one of his addresses. The National Curriculum Framework (2005) recommends a dedicated period every day in schools for children to understand and practice art. It also proposes forums like weekly Bal Sabhas in schools where children can showcase their talents. But is it enough? Can active participation in arts make education more holistic for children and can arts education itself be re-oriented? Artist and teacher Antara Pain is of the view that the pressure of studying academic subjects increases because they are important in the competitive world. “Fact is as you go to senior school, time for art, craft, sports etc reduces as academic subjects become vast. Maths becomes algebra and geometry, Science becomes chemistry, physics, biology etc. You need the academic subjects because they have career potential as compared to the non-academic ones. 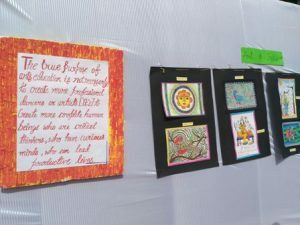 This is the gap that needs to be filled by motivating the child so that in spite of exam pressure, they continue to pursue at least one kind of art form,” she told Delhi Post, adding that art is known to be “healing and meditative”. “Culture is an integral part of every society and its understanding and integration is essential for a healthy and progressive world,” she said. This and more was highlighted at the official launch of Khilta Bachpan campaign by NGO ChildFund India at the Sarvodaya Co-Education Senior Secondary School, Masjid Moth in New Delhi recently. Initially launched in 60 government schools in low-income communities in Delhi presently, the campaign will be expanding to over 2,000 schools in 15 states where the NGO is running its long-term programmes in support of Right to Education (RTE). “Every school under RTE is supposed to have a library but majority of them don’t have it. We have set-up a lot of libraries. Now we are setting up art corners. We have schools where it is there but the process is still not streamlined. We are in talks with NCERT to really formalise it. 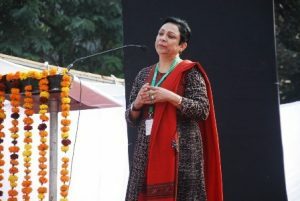 But it will take time as theory and practice are still different,” Neelam Makhijani, Country Director and CEO, ChildFund India told Delhi Post. Through the campaign, government school children are to be part of different art forms like painting, drama, dancing, music and singing through partnerships with various like-minded government and non-government, corporate and funding organisations as well as individual artists. “Infrastructure and opportunities become manifold for children with such initiatives,” Head of School Dr. Santhosh Kumar N told Delhi Post. Besides enhancing communication and expression in children, the campaign also has its eyes on building fine motor and problem-solving skills and promoting self-esteem and motivation among children in government schools. “We work with deprived children, and child protection is our strategy. Child protection is where children feel secure and confident in a safe environment. What ChildFund India has always done is to look at the root cause and not the symptoms. The campaign is not even art therapy. It is an interesting concept,” said Makhijani. She further stressed that the campaign aspires to help children form a perspective, lose inhibitions, gain confidence as well as harnesses their potential and incubates their talents. For creating an art-friendly atmosphere in government schools, the campaign will engage local artistes for arts appreciation courses, engage in advocacy for mainstreaming of art education in schools, capacitate and train point teachers for sustainability of the campaign besides establishing art corners within schools. AAP MLA Somnath Bharti while appreciating the initiative stated that “every child is unique and that uniquessness has to be identified and worked upon”. As part of a panel on ‘Importance of promoting Art as a tool for socio-emotional development and collaborating with various stakeholders for creating a better place for children’, Snigdha Bisht, Programme Officer for Culture, UNESCO, New Delhi further emphasised that “education integration is just a beginning” considering that there are many people who are pursuing arts out of “sheer passion” and “without support and ecosystem”. The panel also comprised Professor Jessy Abraham, Jamia Milia Islamia University, Dr. Asha Singh, Independent Child Development Professional, Theatre artiste and Founder Director of Laa Po Laa TIE-INDIA Walter Peter, and NCERT’s Dr. Sonika Kaushik. The launch which witnessed school children, principals, representatives from various corporate organisations, government and non-governmental organisations as well as individual artists also saw theatre performances by children trained by artistes Kathak Dancer Richa Jain and artiste Peter. “We practised since 10 days and it was so much fun,” Shweta Dhyani, a Class 6th student who performed in the play, and is also a part of a girl’s football team in the school shared with Delhi Post.